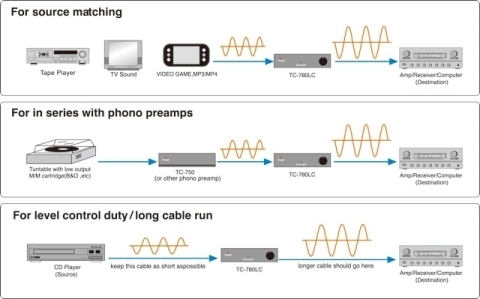 other sources, or to allow the use of a longer than normal cable run between components. The TC-780LC can be used to correct the annoying level mismatch caused by very low output MM cartridge brands such as B&O. ․Offers high and stable performance with low noise and high gain. ․Accepts input from pre-amp output and boost to appropriate level suitable for power amplifier.